Measure the flow rate at your plant with the EF200, a vortex flowmeter that highly accurately measures volume and mass flow and steam dryness* over a wide measurement range. The EF200 can measure flow volume and mass for steam, air, and water over a wide measurement range with a high degree of accuracy. It uses an inbuilt temperature sensor to make instantaneous adjustments to the mass flow rate of saturated steam, comes with a large, easy-to-read display as standard, is capable of simultaneous analog (e.g. real-time flow rate) and pulse (e.g. cumulative flow volume) output, and can be monitored remotely. With a Steam Dryness Fraction Calculator* and Overvoltage Protection*, the EF200 is the perfect tool for measuring and managing the steam flow rate in your plant. The inbuilt LED display can show real-time flow rate, cumulative flow rate, temperature and flow energy data all at once. It can also show one measurement and a bar graph of data for that measurement at the same time. The size of displayed characters can be increased so that the screen can be read from afar. A diagnosis tool gives prompts on how to reset the system if there is a measurement error. The system is capable of simultaneous analog and pulse output as standard. Real-time flow rates can be recorded continuously on a pen recorder. Cumulative flow volume can be displayed on a counter. The analog output span and the weighting of the pulse output can be adjusted, and can be easily input directly into data loggers and programmable controllers. The display module stores a backup of user settings to reduce set-up time when the system is reinstalled. The display module can also be removed from the body of remote models and used to duplicate the flowmeter's settings in multiple EF200 devices, allowing users to save a significant amount of time on installation. Single-unit models have IP66/IP67 standard protective casing and can be used outdoors. The display can be easily rotated horizonally to the front or back sides of a pipe (up to 350°) and the display module can be rotated vertically and set at 45° intervals, making installation simple. The display module of remote models can be installed up to 30m away from the body. For example, the body can be installed on piping above a rack, and the display module can be installed in a low, easy-to-see location. 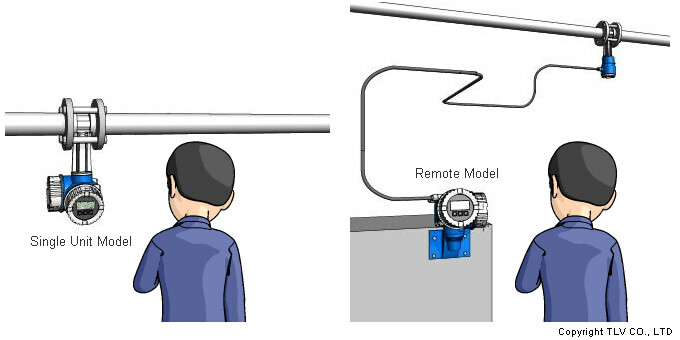 Installation simply requires cutting a space in the piping and installing the vortex flowmeter inline, with no connecting pipes required. For power, the EF200 can use an external power source of between 12V-35V DC. The EF200 provides precise, wide-ranging measurement of flow volumes and rates even on processes and equipment with large fluctuations in flow rate. Wet saturated steam, which contains water particles, can be the cause of problems such as pipe rust and water hammer. However, wet steam is necessary in certain production processes. EF200 models with this feature can calculate the "dryness fraction" of saturated steam to help users monitor and improve the quality of their process steam. Improve the quality of process steam. Monitor humidity in processes that use wet steam. What is the "dryness fraction"? The "dryness fraction" represents the percentage mass of steam in wet saturated steam. Notes: 1) The accuracy of dryness fraction measurements varies depending on the level of dryness. See the EF200 SDS for details. 2) The Steam Dryness Calculator feature cannot be used on certain models and sizes of EF200, or at certain pressures. For more information, contact TLV. Regular inspection required for leaks on connecting pipes and for the seal pot's outer barrier fluid. 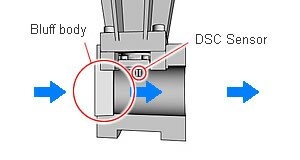 The EF200 detects mass flow using a state-of-the-art balancing capacitance-type DSC sensor. It performs measurements with a high resistance to noise from causes such as sharp temperature fluctuations or vibration. Additionally, the sensor offers superior durability due to its simple construction with no moving parts. Additionally, using the built-in temperature sensor and mass flow adjustment calculation feature, the EF200 detects fluctuations in steam temperature and makes automatic adjustments to mass flow values in response. When an object (a "bluff body" or "vortex shedder") is placed in the middle of a flowing fluid, the fluid sheds vortices in a regular pattern downstream from alternating sides of the object's body. These vortices are called von Kármán vortices. A vortex flowmeter makes use of the directly proportional relationship between the shedding frequency of the von Kármán vortices and the velocity of the fluid in the pipe (volumetric flow rate). It measures the flow rate accurately by using a DSC sensor to measure the shedding frequency of the von Kármán vortices. Vortex flowmeters measure the flow velocity and display the measured flow rate as the volume of flow. However, the amount of steam is normally expressed as a mass flow rate using units such as kg/h or t/day. Consequently, flow meters convert their volume flow rate measurements to mass flow rate measurements. The specific weight of steam varies greatly depending on the steam pressure, so when measuring the flow rate of steam that is undergoing pressure fluctuations, it is not possible to achieve an accurate mass flow rate if calculations involve only a single specific weight. The graph above shows the true specific weight values of steam at a constant flow rate over a range of pressures from 0.3 MPaG [43.5 psig] to 0.7 MPaG [101.5 psig], and the percentage deviation of the specific weight value used for unit conversion, 0.5 MPaG [72.5 psig], from the true specific values. As we can see from the graph, though the deviation is zero at a pressure of 0.5 MPaG, the deviation grows larger as the pressure moves away from 0.5 MPaG in either direction. The EF200 avoids this problem by making adjustments to its displayed mass flow value. It achieves this by performing calculations using the correct specific weight in real time. In the case of saturated steam, the specific weight can be identified if either the temperature or the pressure is known. To identify the specific weight of superheated steam, it is necessary to know both the temperature and the pressure. No additional equipment is required for measuring saturated steam. The compact single-unit transmitter calculates and displays the compensated mass flow for saturated steam even when the pressure fluctuates. 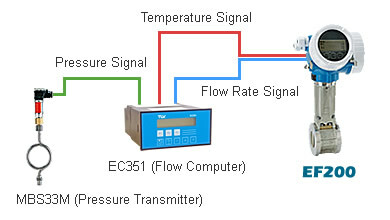 Combine a pressure transmitter with the EC351 flow computer to calculate the real-time compensation for superheated steam and air measurements even when pressure fluctuates. 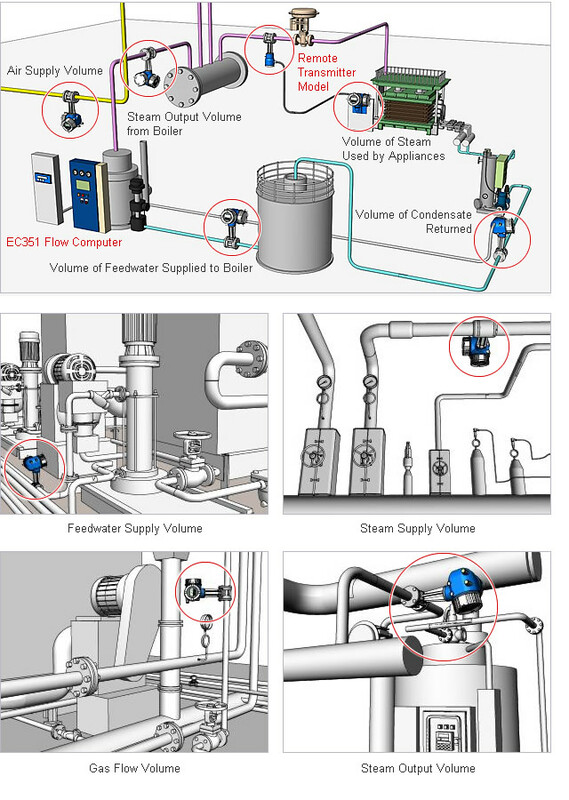 By measuring the flow of steam out of the boiler and condensate into the boiler, plant managers can monitor and manage the total volume of steam used in the plant and develop strategies for solving issues related to steam usage. Additionally, by installing the EF200 immediately in front of steam-using appliances, managers can monitor the steam usage of each appliance and sector and identify running cost and efficiency problems.